Residents and nonresidents may obtain a Concealed Pistol License (“CPL”) in the District of Columbia, but only if they satisfy very stringent requirements. By now, about 110 applicants have received licenses. D.C.’s concealed carry regime is similar to Maryland’s in that the CPL is only good for two years. So, a Concealed Pistol License holder must apply to renew his or her license every two years. Because the first licenses were issued in early 2015, licenses are now starting to come up for renewal. The District is charging $75 to submit a renewal application. Additionally, the District is requiring each applicant for renewal to meet a training requirement. Thus the applicant for renewal will need to submit proof of an additional 4 hours of classroom training, including training in DC law of self-defense, and 2 hours of range training from an MPD certified concealed carry instructor. The range training has been waived for veterans with comparable experience. For now, D.C. does not appear to be requiring the resubmission of the extensive documentation required to obtain the initial permit. At least at this stage, the applicant is required to certify that the conditions existing that gave rise to the initial license application still exist. So, for example, if an applicant based his application on carrying large sums of money or other valuable property, the applicant must certify that this is still the case. Submission of fingerprints, etc. required for the original application is also not required for now. The District is running a criminal background check on renewal applications prior to issuing the renewed carry license. Arsenal Attorneys' George Lyon represents clients in CPL applications, appeals, and renewals, and he is also a DC-certified instructor to provide the training required for applications renewals. He is pictured above with journalist Emily Miller, who received George's help in completing the training for her own CPL. Just like a CPL, George's instructor certification must be renewed every two years at a cost of $400. You may watch a video of George and Emily discussing DC's arduous process in a video at this link. See below video of Arsenal Attorneys' George Lyon and journalist Emily Miller discussing the challenges of obtaining and renewing a District of Columbia Concealed Carry Pistol License. George provided Emily the required 4+ hours of classroom training and 2+ hours of shooting instruction at the range. This discussion took place at the range at the headquarters of the National Rifle Association in Fairfax, Virginia. 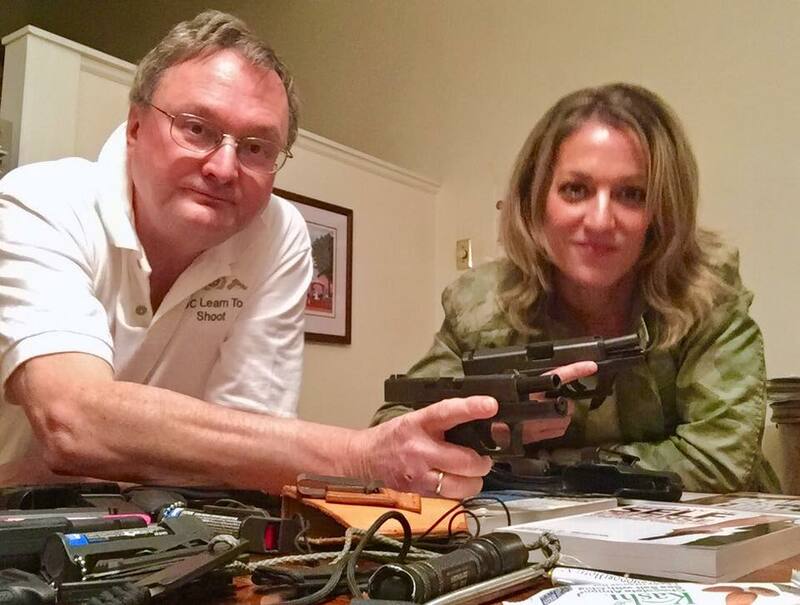 Emily wrote about the arduous process of becoming a gun owner in Washington, DC in her book 'Emily Gets Her Gun.' Later she was one of the first people to obtain a DC carry permit. Arsenal Attorneys' George Lyon is a long time Second Amendment litigant in landmark court decisions, including the US Supreme Court's decision in Heller and the more recent Palmer case which compelled DC to issue carry permits to residents and non-residents, albeit with extremely difficult requirements. Contact Arsenal Attorneys for help with carry permits and other firearms-related legal matters concerning gun owners and the firearms industry. Our firm also provides legal services in business law, estate planning, criminal defense, civil litigation, administrative law, Second Amendment, law, and more. Arsenal Attorneys' Matthew Bergstrom will be one of the speakers at the 20th annual National Firearms Law Seminar during the NRA Annual Meeting in Atlanta on April 28. Early pricing for registration is availalbe through March 31st. The 2017 Seminar will include discussions about current constitutional litigation across the country, new federal and state laws and regulations, defending firearms dealers and manufacturers, preventing unjust verdicts in self-defense cases, how best to organize and operate gun ranges and clubs, developing and managing a firearms law practice, and legal ethics. Speakers will include Massad Ayoob, Stephen Halbrook, Professor Nelson Lund, James B. Vogts, James P. Vann from BATFE, Matthew Bergstrom, Judge Richard Dietz of the North Carolina Court of Appeals, Morgan Shields of the NRA Office of the General Counsel, and NRA-ILA Senior Research Attorney Chris Zealand. The special luncheon speaker will be Sandy Froman, former NRA President. For more details about the seminar, visit this link. To learn about events throughout the NRA Annual Meeting, visit this link. ATF informed Dead Air it no longer shares the opinion of the Bardwell letter, and asked the silencer manufacturer to immediately cease its unrestricted disribution of wipes. Consequently Dead Air immediately discontinued sales of what were disposable accessory wipes for their products. Dead Air announced they were in the process of developing longer-lasting inserts which even if considered part of the silencer would allow these designs to continue functioning. We can only speculate why ATF has changed its interpretation of their earlier opinion letter, but it's possible they are preparing to restrict what they see as the next threat to proliferation: home manufacturing of firearms, particularly using 3D printers. It is a felony to manufacture a silencer at home prior to receiving an ATF-issued Form 1 Tax Stamp. Arsenal Attorneys are concerned not only by the decision to regulate wipes as “suppressor parts” per se, but also with the inconsistency in policy that leaves the public vulnerable to swift and arbitrary changes to the rules. Arsenal Attorneys’ George Lyon attended the Rangemaster Tactical Conference March 17-19 in Little Rock, Arkansas. Here’s his after action report. This was my second time attending the conference. Last year I attended in Memphis, Tennessee at the Memphis Police Academy, an excellent venue. This year’s event was at the Direct Action Resource Center, called DARC For short and pronounced ‘Dar-C’, a premier training site for tactical specialists – surrounded by Arkansas swamp – with a shoot house, a Russian chopper situated on a tower for fast roping, an airliner body, sans wings, for hijack scenarios, and a variety of ranges ringing the facility. The facility is best known for its anti-terrorism class, open only to military and law enforcement personnel. The Rangemaster event, previously known as the “polite society” conference included some of the better known firearm and self-defense instructors in the country, including Massad Ayoob, John Farnam, Marty Hayes, Craig Douglas, Greg Ellifritz, our friend John Murphy from FPF Training, and of course Tom Givens of Rangemaster. A good deal of the conference was devoted to legal issues with Manny Kapelsohn speaking on lessons learned from previous self-defense shooting cases, Skip Gochenour speaking on the role of provocation in defeating a self-defense claim, and Andrew Branca distilling his excellent four-hour class on the law of self-defense into two hours. Mas and Marty spoke on the potential role of a firearms instructor as an expert witness, the class I most anticipated. In addition to the speakers’ presentations, the ranges were in use all three days, with one devoted to a shooting competition and others devoted to a variety of classes taught by among others John Hearne, Chuck Haggard, and Tom and Lynn Givens. There were also classes on combatives, tactical medicine, and a variety of lectures. Some of the highlights of the conference for me were Tom Given’s lectures on “Active Killers” and “Defining the Threat” as well as two tactical scenarios. In this blog, I will address Tom’s lectures. In a subsequent blog, I’ll share the learning points from the two tactical scenarios. Average active killer incident ended by police: 14.29 deaths. Average incident ended by armed citizens: 2.33 deaths. In both of his lectures Tom stressed a crucial point for survival: carry a gun. He went through a litany of active killer events emphasizing that in each case the killer’s goal was inflicting the highest number of casualties and in each of those events, each of the dead victims had been unarmed. In the vast majority of those cases when confronted with armed resistance the killer either committed suicide or simply gave up. When active killer incidents are ended by police response, an average of 14.29 persons are killed. When active killer incidents are ended by armed citizen response, an average of 2.33 persons are killed. What does that tell you that you need at an active killing event? Tom says it’s clear. “Carry a gun,” he said. Tom’s lecture on “Knowing the Threat” had a similar theme. The odds say that one in 30 adults will be a victim of violent crime in any particular year. That statistically resolves to a 1 in 4 chance of being a victim of violent crime in one’s lifetime. Women have a 1 in 60 chance of being raped in any one year. Ten percent of violent events happen at home; 90 percent happen someplace else. If you had a 1 in 30 chance of your house catching fire in any one year, would you have fire insurance, a fire extinguisher, a plan for how you would handle a fire? Do you think you need a plan for handling a violent confrontation both inside and outside the home? Do you think that might involve having a gun available at every possible moment? Again, Tom’s advice is to carry your gun. Interestingly, Tom addressed statistics suggesting a drop in crime. He acknowledged that the murder rate is down, but explained that is a function of advanced trauma care. When you don’t die, the police don’t call it attempted murder, they call it aggravated assault. The result of an aggravated assault can leave you blind, substantially incapacitated, paralyzed, bankrupt from medical expenses, etc. Admittedly, better than dead, but maybe not so much. Just “carry your gun,” Tom repeated. Like George Lyon, Arsenal Attorneys™ team includes lawyers who are certified firearms instructors, federal firearms licensees, former law enforcement, and criminal defense attorneys, particularly for self-defense cases. Our attorneys are available for personal consultations in self-defense law for gun owners, which we offer at our offices or by phone or video conference nationwide. The firm also offers legal services in business law, estate planning, civil litigation, personal injury and other areas of law. Baltimore, Howard County act on electronic weapons ban in face of lawsuit. Chief Judge Catherine C. Blake of the U.S. District Court in Maryland signed an order temporarily halting part of a federal lawsuit that challenges bans on the electronic weapons in Baltimore City and Baltimore and Howard counties, pending action by the city. Six local residents — including Leah Elizabeth Baran of Howard County and Douglas W. Hansen of Baltimore — sued local officials in late January over their right to own and carry the weapons. Mayor Catherine Pugh said the city and plaintiffs "have agreed to wait up to 90 days to allow for potential legislative action by the City which would remove the need to move forward with the lawsuit." Howard County lawmakers lifted a similar ban Tuesday in response to the lawsuit. Both jurisdictions, along with Baltimore County, have had longstanding restrictions on the use the stun guns, which the plaintiffs argued are necessary for self-defense as an alternative to lethal force. Their argument is bolstered by a U.S. Supreme Court decision in March 2016 that questioned the constitutionality of stun gun bans and suggested that Second Amendment protections applied to electronic weapons. The decision did not declare stun gun bans wholly unconstitutional; instead, the court rejected the arguments of a Massachusetts court for upholding the ban. Anne Arundel County — the first county to ban stun guns in the state — lifted its restriction in 2013. Some warn that the stun guns can be deadly if used by untrained people. The devices use compressed nitrogen to fire two small probes attached to conducting wires. Once in contact with a person's body, the device transfers enough voltage stop the target's motor functions and inhibit muscle control without causing injury. The effects become more pronounced the longer the device is used: A half-second jolt is startling, while a second or two can leave a person dazed. Longer than that leads to loss of balance and muscle control. Baran and the other plaintiffs argued that unlike weapons such as batons or knives, Tasers allow individuals to apprehend an attacker at proximity. Baran wants to be able to use a stun gun because a former boyfriend who was sentenced to prison for 30 years for sexual assault in 2014 threatened to harm her after he was released. "When he says he's going to do something, he's going to do it," Baran said. "Going to jail won't change that." Baran is trained to use firearms and has a handgun qualification license from the Maryland State Police, but she argues a stun gun is a less lethal defense option. The company she tried to buy a stun gun from, Taser International, won't ship one to her house because she lives in Howard County, according to the lawsuit. Hansen, who lives in Baltimore's Remington neighborhood, also has been trained in firearms, according to the lawsuit. He is "ready, willing and able to use deadly force to defend himself and his home" but worries about the consequences, including psychological ramification and the potential to be taken into police custody and prosecuted. George L. Lyon Jr., a lead attorney on the lawsuit, said the case aims to restore local residents' right to "an effective self-defense tool." His firm, Arsenal Attorneys, represents gun owners and the firearms industry and challenged the stun gun ban in Washington, which officials there moved to repeal last fall. Lyon called Howard's action "long overdue" and said he hopes Baltimore officials will "take the next step and outright repeal the ban that's been in place." "There are circumstances when deadly force might not be appropriate," Lyon said. The plaintiffs "see this as giving them another potential tool to use." A motion was filed to dismiss the case against Howard County, following repeal there. The litigation involving Baltimore County is ongoing, Lyon said.